The walk is a four–beat gait. It begins with the horse stepping forward with his right rear foot. This is followed by the right front. The left rear is next, followed by the left front. It may appear that the gait begins with the front foot because this foot rises first. The hind foot, however, provides the push that allows this to happen. The walk is a very stable gait with three feet usually on the ground at any one time. As a horse walks, its belly swings back and forth as the horse makes room for its alternate hind feet to step forward. The horse's pelvis may also rotate laterally. The horse's head moves while it is walking. This movement may serve two purposes. One is balance. 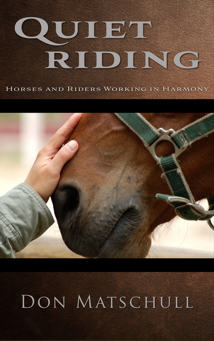 Therefore, the rider should allow this movement by having his hands follow his horse's head rather than the head being held rigidly in place by the rider's hands. The movement of the horse's head may be forward and back, side to side, up and down, or — more likely — a combination of these. The second purpose for a horse moving its head is to aid its muscles in lifting its front feet and legs. This is especially true when the horse is moving with impulsion. One should always begin a riding session by walking his horse. This allows the horse to loosen up his joints and muscles before the more strenuous work begins. Walking the horse at the end of a session allows the horse to cool down slowly, reducing the heart rate while using the motion to help pump blood to the horse's muscles bringing them oxygen and carrying away waste. The rider should not be lazy while doing this. He should use this time to attune his body to the movements of his horse. Many riders — especially young riders — fail to appreciate the importance of the walk when riding a horse. They feel that "real" riding is done at the faster gaits. 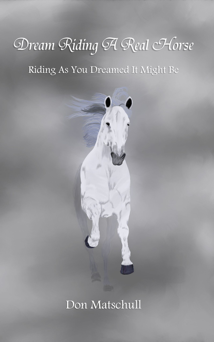 How a person rides the walk, however, has much to do with how he will ride the trot and the canter or lope. The slower pace of the walk allows the rider to think about what is happening. The smoothness of the walk makes it easier for the rider to relax and allow his body to move with the horse. The more a rider practices moving with the horse at the walk, the easier he will find it to move with the horse in the other gaits. Many people fail to sit properly at the walk. Sitting properly as described in the section on the seat with head over hips over heels is the key to moving with the horse. As in all aspects of riding, balance and relaxation are key to riding well. A well–balanced, relaxed rider should have no trouble feeling how the movement of the horse moves his body. When sitting evenly with one seat bone on either side of his horse's spine, the rider should feel his seat bones moving in small circles — down, forward, up, down, forward, up — 180 degrees off from one another. At the same time, the rider's legs swing side to side and his pelvis rocks to follow the swinging of the horse's barrel. The relaxed rider's lower spine moves every which way. The better a rider allows his body to move with the movements of his horse, the more the horse becomes accustomed to the two bodies moving together. The rider can, then, use this to help control his horse's movements. The rider, by emphasizing or retarding the movement of his pelvis, can effect the length the horse's stride. A rider ceasing to move with his horse can influence the horse to stop its movement. See more in the section on stopping. I try to teach riders to be aware of what their horse's feet are doing. Learning this can best be done at a walk. The pace is slower, and the student has time to sense the difference in movement as the horse lifts or puts weight on one foot or another. Being aware of the position of his horse's feet allows the rider more precision in timing his cues. The more precise the cue, the more timely the response. The walk is also a good time to learn how one's breathing can affect a horse's movement. Often, a rider can help calm a nervous horse by taking slow, deep breaths while walking. This is only one of the techniques I use in getting the horse to relax. See the section on the learning process for more information on relaxation. Again, because of the slower pace, the rider tends to be more relaxed. This enables him to both follow my instructions and sense the results.